Music is an integral part of our Christian faith. And because it is so important to praise God in song, we offer opportunities for children, youth and adults to grow and share their gifts with this congregation and the Annandale community. No matter your skill level or ability, there is a place for you to share your gifts in our music ministry. I hope that you will take a moment to find an ensemble in which to share your talents here at AUMC. 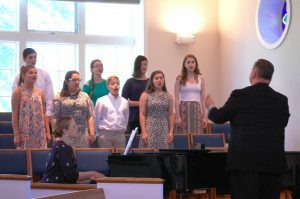 Our children’s choirs meet on Sundays during the school year (September-May) and typically sing about once a month, as well as at special services such as The Hanging of the Greens. The Cherub Choir, for preschool children, meets at 9:45 a.m., and is directed by Miranda Lansberry. Margaret Vaughn and Katie Ogle lead the Celebration Singers, for K-5th Grade children, from 9:15-9:50 a.m. in Room 304. Our Adult Choir provide music for the majority of the services and events at AUMC. We are always open to new folks who would like to join us. Rehearsals are on Wednesdays, 7:15-8:45 p.m. in the Choir Room. 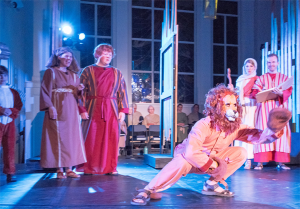 AUMC’s Music Ministries periodically puts on fully staged Broadway musicals, which have included The Sound of Music (2006), The Music Man (2008), Joseph and the Amazing Technicolor Dreamcoat (2010),The Wizard of Oz (2014) and Children of Eden (2017). The Annanbells are AUMC’s handbell ensemble, for musicians who are college age and up. Rehearsals are on Sundays, 5:30-7 p.m. in the Sanctuary. This group is not auditioned, but sight reading ability is necessary for participation. AUMC also features solo musicians and special ensembles during services, as well as hosting concerts. Please let Pat Vaughn know if you are interested in sharing your instrumental gifts in worship. He can be reached at pvaughn@annandale-umc.org or 703-256-8330.